A mouse decides one morning to make an omelet, but needs an egg, and sets out to find one. On his search, he eventually finds everything needed to bake a cake, including apples, flour, and sugar, but also those most precious ingredients—community and friends, from a hedgehog to an owl to a raccoon— and learns about the unexpected gifts of asking for what you need and sharing what you have. Davide Cali is an award-winning children's book author of more than fifty books, including A Funny Thing Happened on the Way to School, The Queen of the Frogs, and When an Elephant Falls in Love. He lives in France and Italy. Maria Dek studied art at the Academy of Fine Arts in Warsaw and University of the Arts, London. She is based in Bialowieza, Poland, in the oldest forest in Europe. Her prior books include A Walk in the Forest and When I am Big. "In this charming and cumulative tale, a small mouse is hungry for an omelet, but doesn't have an egg." "This charming story is about friendship, sharing and how teamwork and compromise can bring big - and delicious - ideas to life. And it's a lovely reminder of the importance of breaking bread together and coming together as a community." 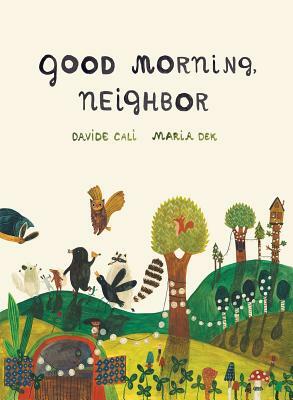 "The roving (and ever growing) band of merry would-be bakers will bring smiles to small readers, who will rejoice in reciting the growing list of creatures and chiming in with their choral salutations of each new animal: "Good morning, neighbor." This endearing story's accumulation of animals, donations, and repetitive phrasing cleverly underscores (and embodies) the abundant, collaborative love of a tightknit community. Dek's watercolor illustrations evoke folk-art charm with their straightforward brush strokes, chunky caricatures, absence of perspective, and inherent warmth expressed through lovely details. Teamwork, sharing, and neighborly friendship emerge as integral ingredients in this sweet, satisfying book for young readers."